We’re excited to announce that this fall, Margaret will be hitting the road with a brand new national stand-up tour, Cho Dependent. Margaret’s new tour will feature new stand-up and a few live performances of songs on her forthcoming comedy music album of the same name. The nationwide tour kicks off on on August 26th and runs through December 12th. Below is our current list of cities, and we will be adding more along the way. Fanclub pre-sales for most of the shows below* begin Wednesday, June 9th at 10am local time and end on Thursday, June 10th at 10pm local – two full days before tickets go on sale to the general public at 10am local on Friday, June 11th! 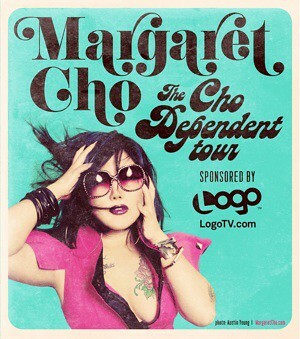 You can find complete ticket and show information for Cho Dependent on Margaret’s Tour Page. Ticket Links will become active and ready to go at 10am local time on June 9th. The Fan Club password is only available to those on Margaret’s mailing list (sign up here – it’s free!). Fan Club pre-sale tickets are limited and move very quickly. As a special gift, all fans who purchase tickets during the Fan Club pre-sale will receive an automatic download link at the conclusion of the pre-sale to “No Offense” a comedy song Margaret collaborated on with Susie Suh and Garrison Starr. Will there be a presale for tickets at the Foxwoods/Mashantucket show? The schedule currently says TBA for that show.